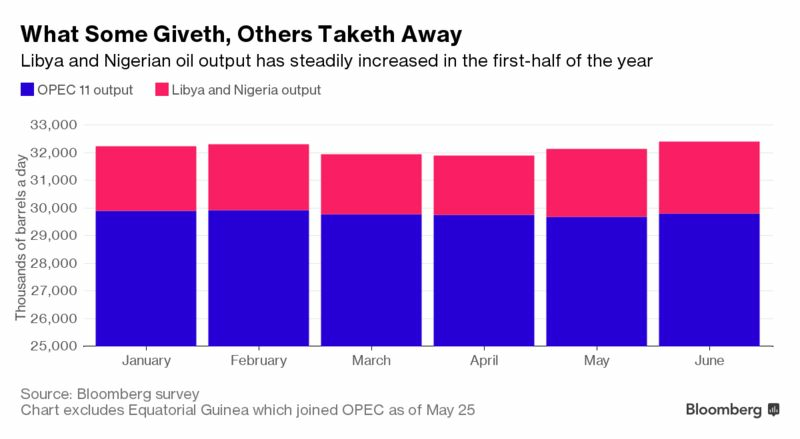 A proposal that Libya and Nigeria could have to accept limits on their crude production probably wouldn’t be enough to put OPEC’s faltering efforts to eliminate a global supply glut back on track. The two African nations -- exempt from the supply curbs agreed last year due to internal strife -- have added enough production in the last two months to offset Saudi Arabia’s cut. Should the pair accept a cap at their desired levels of output, OPEC and allies including Russia would still have to adjust their own quotas to compensate for the increase, said Nordine Ait-Laoussine, president of Geneva-based consultants Nalcosa and former energy minister of Algeria. “It’s not going to be easy just to say ‘Maybe we should just bring Nigeria and Libya into the line and it will be fine’,” Ait-Laoussine said by phone. Adding those two countries without agreeing on new production ceilings for the other participants in the deal would simply be “exacerbating the problem of excess supply,” he said. Several nations from the Organization of Petroleum Exporting Countries plus non-members Russia and Oman will meet in St. Petersburg on July 24 to check up on the success of their agreement to curb output, reduce swollen global inventories and boost oil prices. Since ministers from the group last met in May, oil has fallen into a bear market as analysts and traders lose faith that the cuts are working. Market watchers including Goldman Sachs Group Inc. say deeper cuts are needed to finish the job. Changing quotas for existing participants in the agreement would be “opening a big can of worms,” said Thomas Pugh, commodities economist at Capital Economics Ltd. The group briefly considered and rejected the idea of deeper cuts back in May and Pugh doubts there is much political will to revise the accord now. Crafting last year’s cuts agreement was a major undertaking. Talks started early in 2016 after prices fell to the lowest in 12 years, but a first round of talks in Doha in April ended in failure. They reconvened in Algiers in September and an accord to collectively reduce the output of 11 OPEC and 11 non-OPEC nations by as much as 1.8 million barrels a day was finally clinched in December. With deeper cuts currently not on the agenda, according to OPEC Secretary-General Mohammad Barkindo, the group is exploring other ways the agreement could be adjusted. They have invited Libya and Nigeria to the meeting in Russia to discuss the stability of their production, said Issam Almarzooq, Kuwait’s oil minister. Monthly data compiled by Bloomberg show the two nations added 440,000 barrels a day of production in May and June as they resolved disruptions at oil fields. 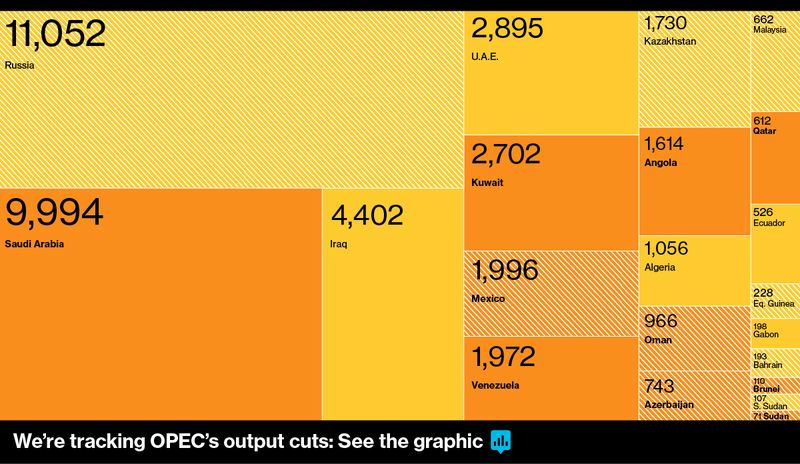 Saudi Arabia, OPEC’s de-facto leader, has reduced output by 460,000 barrels a day this year. Libya’s production even went above the symbolic 1 million barrels-a-day mark earlier this month, the first time in four years. However, the country remains politically volatile and oil output and exports could still be vulnerable to disruptions by armed factions and restive workers. International crude benchmark Brent, which has lost about 18 percent this year, fell 0.6 percent to $46.59 a barrel at 10:41 a.m. London time on Tuesday. The “rather muted” price reaction to potential production ceilings for Libya and Nigeria “highlights that there is probably little conviction out there that such a cap would actually end up being lower than current production levels,” JBC Energy GmbH said in a note on Tuesday. Ait-Laoussine shared this view. He was skeptical that Libya or Nigeria would agree on caps that were lower than their desired production levels since they have been “deprived” of their full capacity for some time. Should they reach their daily output goals of 1.25 million and 1.8 million barrels, respectively, overall OPEC production by year-end may be close to 33 million, he estimates. That’s 1 million higher than the group’s estimate of demand for its crude this year. “OPEC would be producing too much if the other quotas are left unchanged,” Ait-Laoussine said.